The Indiana Minimum Wage Poster is a minimum wage law poster by the Indiana Department Of Workforce Development. This is a mandatory posting for all employers in Indiana, and businesses who fail to comply may be subject to fines or sanctions. This poster must be posted in a conspicuous place where all employees will see it. This poster describes the requirements for the Minimum Wage for tipped and untipped employees as well as training wages for employees under 20 years of age, and the penalties for employers violating Minimum Wage Laws. It appears you don't have a PDF plugin for this browser. 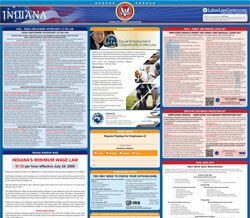 Please see the link below to download indiana-indiana-2009-minimum-wage.pdf. in the area where employees are employed. ment of the hours worked by the employee, the wages paid to the employee, and a listing of the deductions made. days after the employee is initially employed by the employer. of the Indiana Minimum Wage Law. [email protected] or phone (317) 232-2655.